Its been a long time in development for no other reason then we had no time but finally we have a launch of version 2 of Basecode for Basecamp. 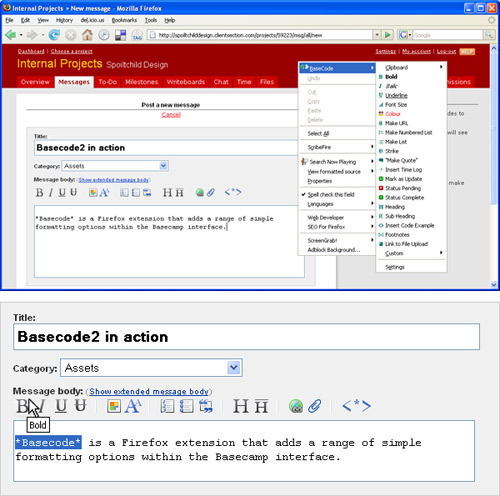 A simple Firefox extension for one of the leading Project Management Applications that adds additional formatting options to the interface. Version one gave access to these options via Right Click. In Version two we actually took away a few of the lesser used options and provided more direct access by adding a tool bar directly within the Basecamp interface. Best of all it is now free!! If you use Basecamp then check it out.